Known for her playful and colour-rich portraits, Daisy de Villeneuve has made a new body of work that combines her signature felt tip technique with water colour. The head and shoulder imagery takes its inspiration from Warhol’s Tattooed Woman Holding Rose, circa 1955, and Peter Blake’s, Loelia, World’s Most Tattooed Lady, 1955. Flower Girl has a face inked with thorny flower stems and a collection of girl’s names that double up as the names of some of our best loved blooms. 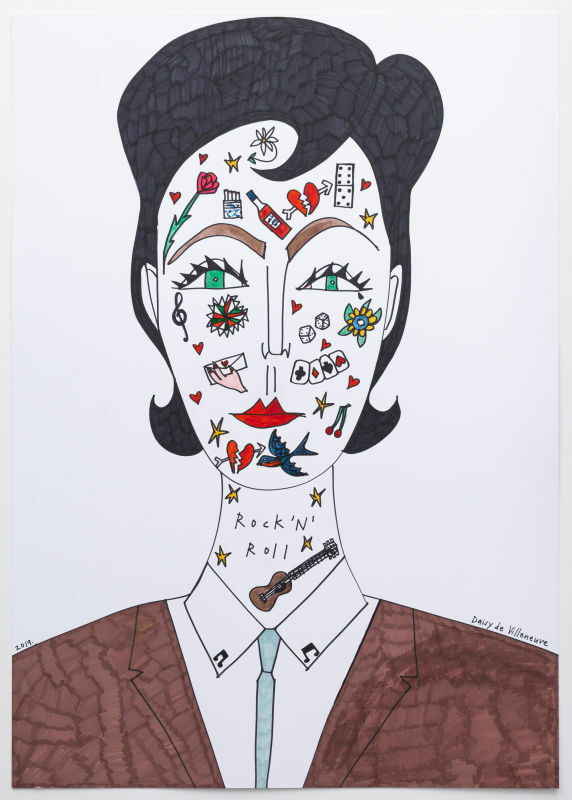 Rock ’n’ Roll takes her style cue from the Fifties with a Teddy Boy quiff and traditional tattoo motifs including broken hearts, cherries and swallows, stars and flowers all from a Lemmy tattoo transfer book for children, if such a thing were to exist. The works vary from the size of a large poster to that of an invitation card. All are unframed and available for sale. FIG Unframed is a one day showcase for established and emerging artists that offers some of fashion’s most talented image makers an opportunity to exhibit previously unseen works direct from their studios. Saturday 16th February, 2019, 10 - 7pm.